However, if you insist on buying champagne, my one piece of big advice would be to give the most expensive champagne a wide berth. A high price doesn’t necessarily guarantee a quaffable product. According to a 2015 study, champagne experts preferred a £40 brand to one costing £400. But even £40 is more than I would pay for a bottle of champagne. There are other options. 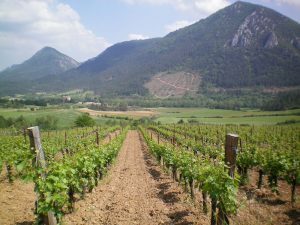 All over France there are vineyards that produce sparkling wines. Many are made using the champagne method (la méthode champenoise). Many are, in my humble opinion much better value than the champagne that you will find on regular supermarket shelves. You may have seen bottles of Crémant in the French supermarkets. This is a sparkling wine that is made using the champagne method. To qualify for the AOC status, the grapes must be harvested by hand and the wines must be aged for a minimum of one year. The Loire Valley is the biggest producer of sparkling wines outside of the Champagne region with most being produced around Saumur. Alongside Crémant de Loire, you will also find Crémant de Bourgogne, Crémant d’Alsace, Crémant de Bourgogne, Crémant du Jura, Crémant de Bordeaux to name a few. The Crémant sparkling French wine is fantastic value. It is available in the UK from Majestics, amongst others, at a very reasonable price. Limoux is located down in the Pyrenees foothills of southern France, not far from the beautiful Medieval city of Carcassonne. 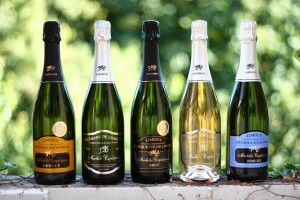 Blanquette de Limoux is one of my favourite French sparkling wines. It is widely considered to be the first sparkling white wines ever produced in France. 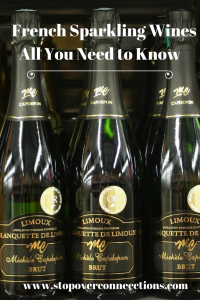 Limoux was created long before the Champagne region became renowned for the sparkling white drink that we know of today. Records show that it was first produced by the Bénédictine monks at the Abbey in Saint Hilaire in 1531. The word ‘blanquette’ means ‘little white’ in the local Occitan dialect. Today, AOC Blanquette de Limoux is still produced from the mauzac grape. The use of chardonnay and chenin blanc grapes is growing but they must not constitute more than 10% of the wine. In addition to the regular Blanquette de Limoux, you may also find Blanquette méthode ancestrale. This sparkling wine is produced in the same area but is a sweeter sparkling wine made in a more old-fashioned way. It is generally cloudier and with sediments of yeast, or lees, still present in the bottle. Mousseux simply means ‘sparkling’ in French. Vins mousseux refers to all other sparkling wines not made using the specific champagne method of which there are many in France. The Loire Valley is again the main producer of quality sparkling wines which you will often find in UK supermarkets and specialist wine outlets. 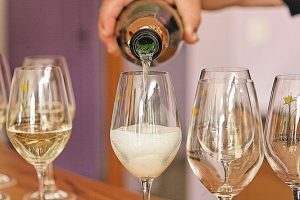 There are numerous ‘caves’ or wine-tasting cellars in the Loire area at which you can taste and buy the delicious sparkling wines from local producers. Let’s not discount champagne completely. My big gripe is with the marketing hype that surrounds the big brand names. The problem is that the elevated price is no guarantee that you will be getting a delicious, quaffable champagne. So if you are determined to have champagne for your festive celebrations, do buy direct from the smaller producers. They would appreciate your support. The champagne region is just 3 hours down from Calais. Explore the ‘Route Touristique du Champagne’. It will guide you through the vineyards and past producers where you can sample and buy champagne for prices as low as €15 a bottle. Base yourself between Reims and Epernay which is at the heart of the Champagne production area, stay at a B&B or somewhere more luxurious and stock up for your next celebrations. Santé!